Ok, ok I've officially accepted that fall is here because it is freaking cold outside!! Like, I-don't-want-to-get-out-of-bed-it's-so-cold cold! Although I think getting dressed in the summer is a lot more fun over being hidden under layers and a big winter jacket in the fall and winter I will admit I am looking forward to many trends for the chilly months. It's out with the neons and pastels and in with rich colours like oxblood, plum, cobalt blue and green. Trade up your mini skirts for leather or metallic leggings - tank tops for embellished long sleeved blouses, blazers and chunky sweaters. And of course there will be no more sandals, it's time to cover up our toes in boots. If all that still doesn't sounds appealing let me help you get inspired with the images below I have compiled to complete my wish list for fall. What are you looking for this fall? 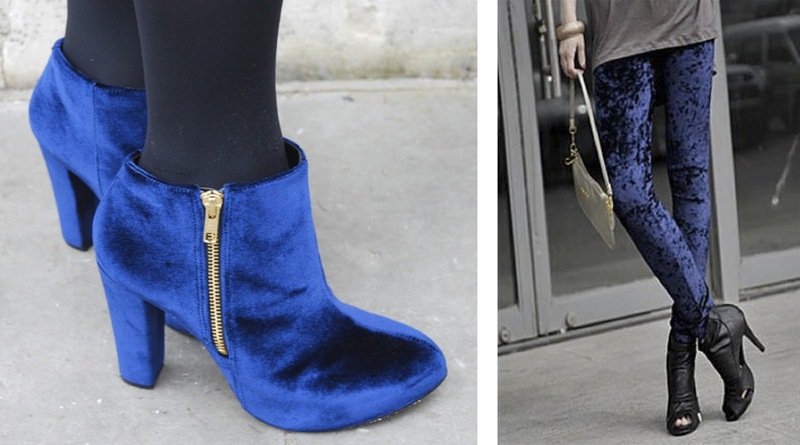 I would love to get my hands on a pair of royal blue leggings. Leopard Loafers. They just complete so many outfits! Tory Burch 797 Crossbody Pouch in Plum. The colour is devine. however this makes me want a pair of studded gloves too! Pleather leggings in all colours please! calf booties. These in the picture I saw on instagram yesterday and have fallen in love. In my last post I shared my love of wearing yellow and taupe together so today I'm showing you one of the looks I wore a lot of over the summer that is made up of this complement. For starters these skinny jeans from Zara are beyond amazing. They are the perfect fit and super soft so I picked them up in three different pastel colours for a price tag of only $45 each. By pairing these leggings up with a basic silk tank there should be no surprise if you are familiar with my style that I have completed my look with a statement necklace. I'm all about having an element of detail that pops with each outfit, it just makes things a little more interesting to look at! I've kept my look neutral with the shoes and purse (this purse I love - it's totally taken over my what used to be my everyday black purse). So there you have it! Some of you have been on board with these colours being worn together and some of you never even thought about the collaboration - so for those I hope this outfit post inspired you a little to try it out for yourself! This is a common colour combination that I have been sporting a lot this summer. As much as I love pairing up my pastels other times I like to break them up and calm them down by wearing them with neutrals. Aside from this wicked cut-out dress that I had to include when I stumbled upon it I also included a simple shirt and pair of pants that fulfills todays complementing colours. With the accessories that I found we can come up with three different looks. Using the accessories up top you can create a relaxed outfit with a bit of an edgy flare to it that would be a great look for a day of shopping or a casual evening of drinks with your lady friends. Using the accessories on the bottom will polish this look off that will make it a great outfit for the workplace if it's considered business casual. 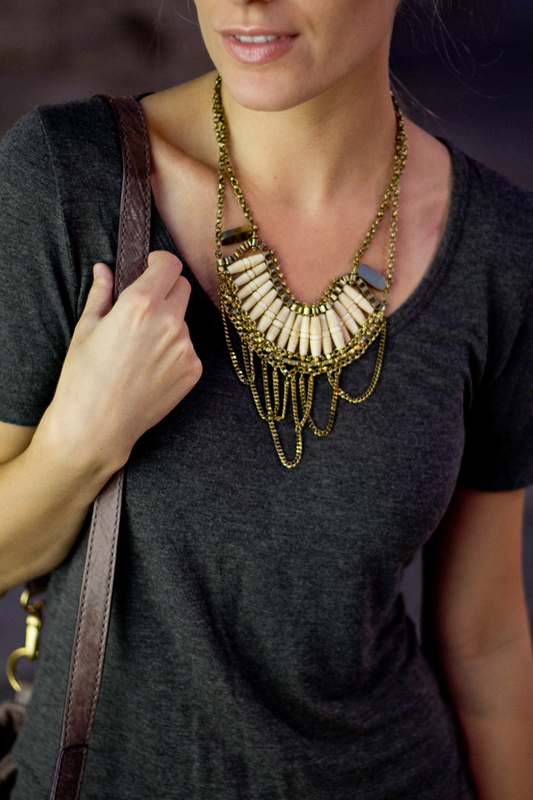 Or hey, wear all of these accessories together and you will look well put together for whatever the occasion! 1 Threadsence, $48. 2 Topshop, $4. 3 Aurélie Bidermann, $445. 4 Dannijo, $245. 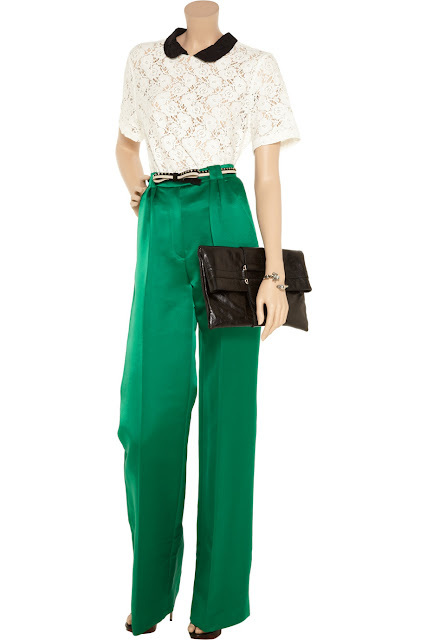 5 J.Crew, $298. 6 Fossil, $189. 7 Elegantly Waisted, $55. 8 3.1 Phillip Lim, $288. 9 Preen, $1063. 1 A.L.C. 2 B.Babaton. 3 Marc Jacobs. 4 Anthropologie. 5 Alice + Olivia. 6 Tory Burch. 7/8 Asos. 9 Topshop. 10 Honora. 11/12 Topshop. 13 Steven by Steve Madden. 14 Rag & Bone. I just love pastels - they remind me of sweet treats and I have a massive sweet tooth! I've always been drawn to them so I was super excited when they became a huge trend this season. 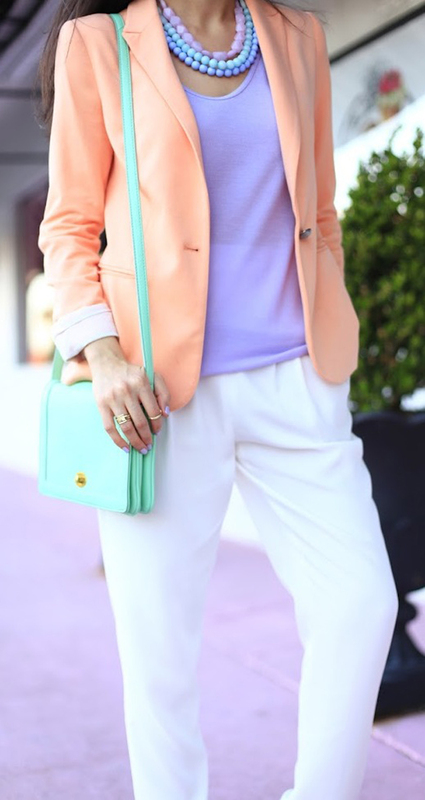 Pastels are beyond fun because they look amazing when worn together. 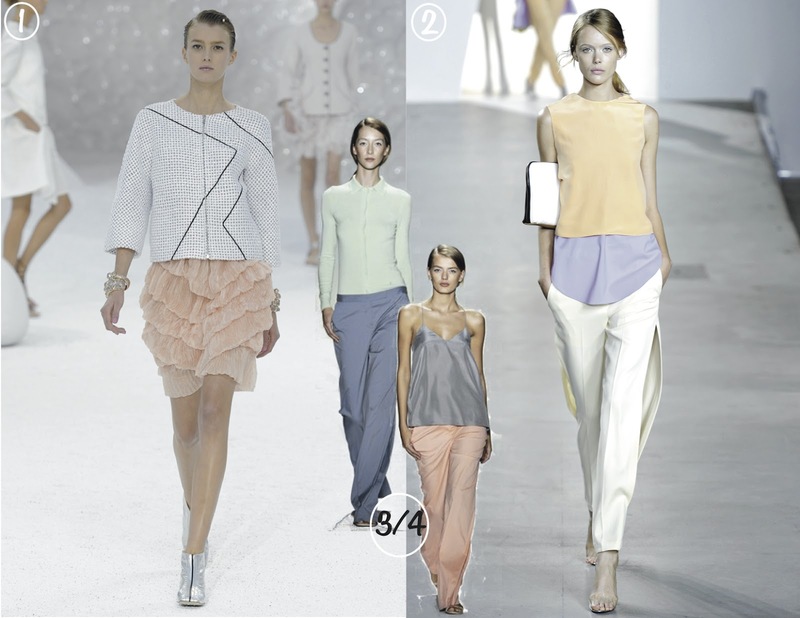 However for those of you that are a bit freaked out by wearing a full on pastel look from head-to-toe there are still several other ways to implement the trend into you daily wardrobe. 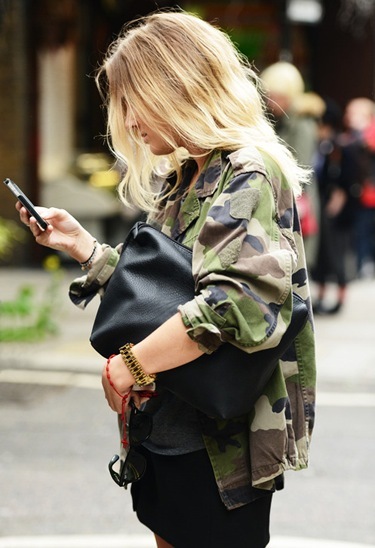 The easiest way is to just add accents to your look like shoes, your hand bag or simply in your accessories. 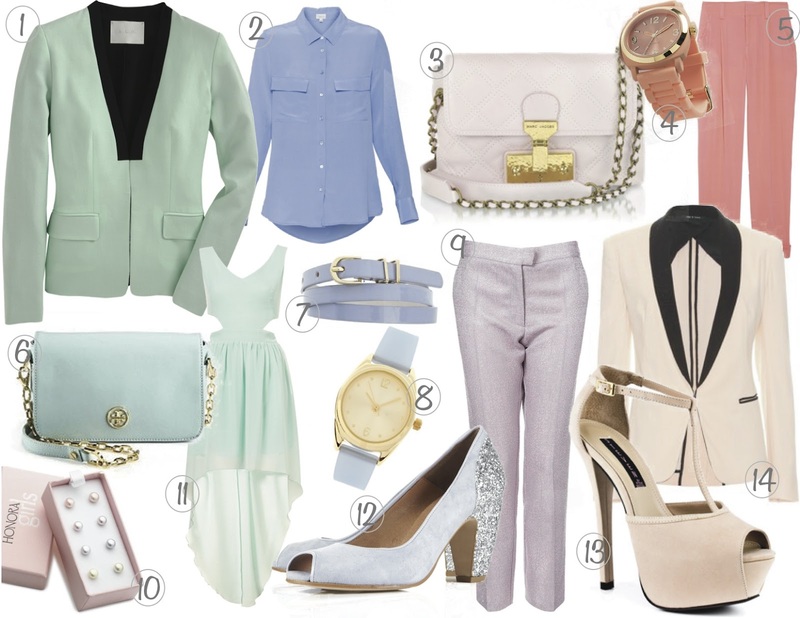 When wearing pastels pairing them with neutrals will complete your chic look. Stick to whites or creams to keep your look delicate and feminine. I will point out that on the runways we did see pops of black peek through in the accessories and details so to keep it striking don't be afraid to follow suit but do remember the key word being "subtle". Oh pretty pastels. I enjoyed wearing them throughout summer and will continue to wear pieces as the cooler months approach. If you can believe it this wicked coral leather skirt is from H&M. The fit, the colour - everything is so perfect. Time and time again I have tried on coral tops and as much as I'm always drawn to the colour because I love it so much I never feel right in the end so to find this skirt was such a score and also a lesson that I prefer to wear this colour on the bottom. I also love to wear pastels together so flipping through my closet I came up with this combination of lavender and coral. It's so feminine and soft and overall it turned into such a beautiful outfit. Top : Club Monaco. Skirt : H&M. 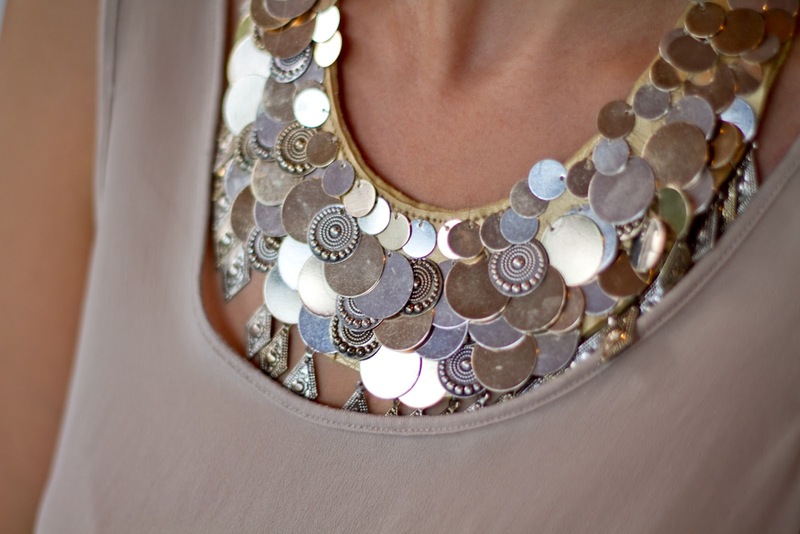 Necklace : Club Monaco. Watch : Michael Kors. Purse : Marc Jacobs. Shoes : Vince Camuto. Just to hang onto summer for a little bit longer I thought I would do this weeks print post on Tropical Punch. Let's make one thing clear though I am not saying that those tacky Hawiian shirts have become cool. 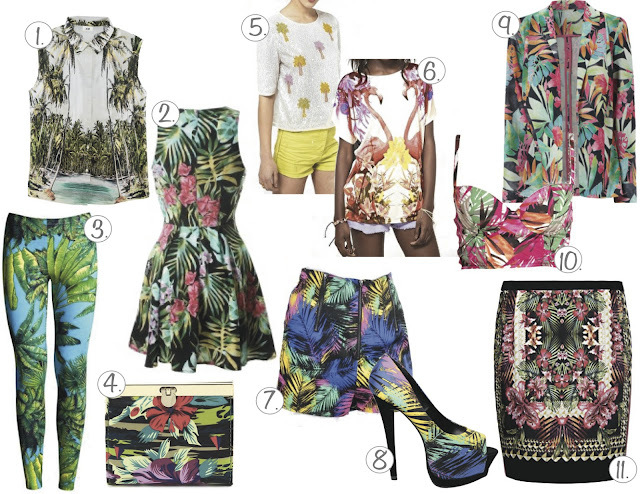 Yes they fit this tropical print theme however let's go deeper into the jungle and get a little more trendy people!! 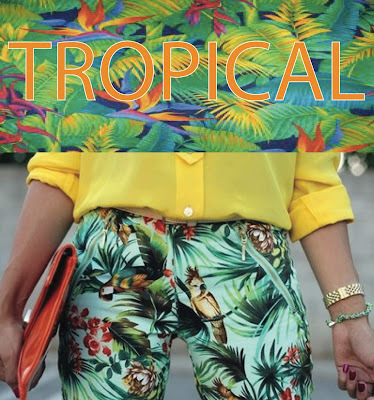 I think this print is a little more difficult to do right just because there is that fine line between a modern and trendy tropical print and one that is all wrong and straight up tasteless. So how will you know if you've picked right? Well let's start off with one obvious rule that is very simple to follow: stay away from Hawaiian flowers. The next tip I would have is keeping in mind current colours and choosing accordingly. Bright colours have been fun this season so just make sure the overall piece uses colours that complement each other well. My final tip would be to mix your prints. One trend that I really really love is mixing prints with prints. When done right it can look FAB-U-LOUS! 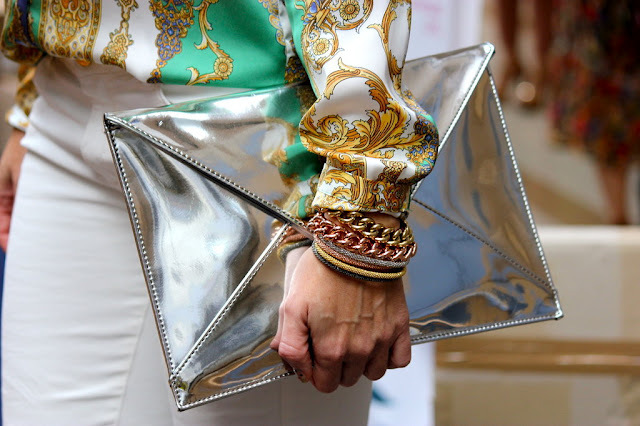 So in my opinion pairing a tribal clutch with your tropical outfit would look amazing! Enjoy below some tropical picks. 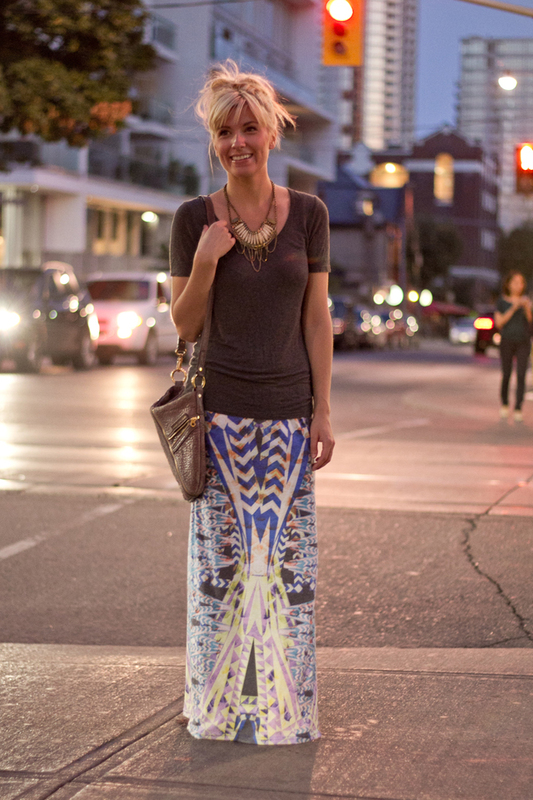 I love the casual flamingo tee but I'm drooling most over the Mango skirt!! 1 H&M. 2 Lace Boutique. 3 Versace for H&M. 4 New Look. 5/6 Asos. 7 Sheinside.com. 8 Owntherunway.com. 9 Jane Norman. 10 Mango.